Due to what seemed a stroke of luck, I came across a very inexpensive way of flight to visit New York for about a week's time recently so jumped on the chance to hop on a jet across the country. I have visited The Big Apple plenty of times before, and it really helped that my brother lives in Brooklyn so I rarely have to worry about lodging. 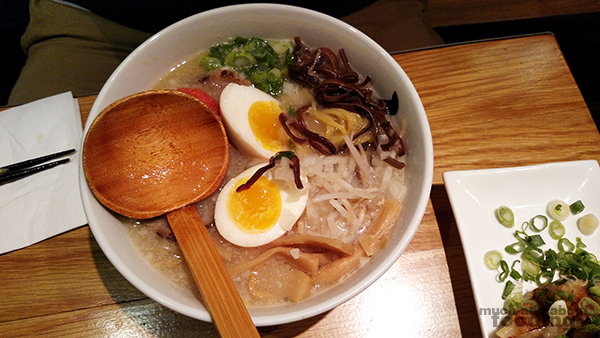 As with other times, the goal was to eat up the city, and thus I started a ramen list. 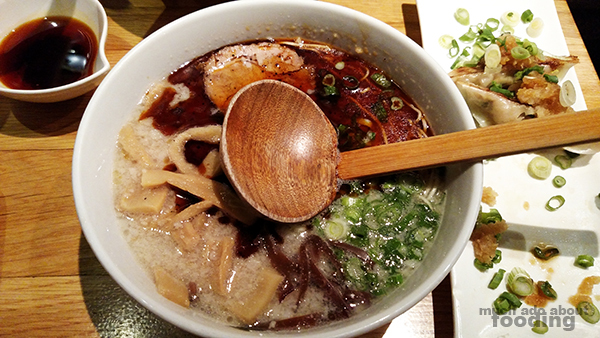 Hide-Chan Ramen was on that list that I was compiling based on other people's accolades and top rated ramen spots. What made it even more perfect for my friend and I to stop into the cozy ramen shop was how brisk the weather was outside. 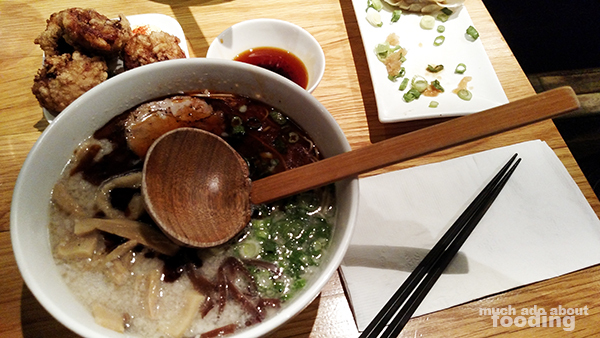 Who wouldn't want a hot, steaming bowl of delicious noodles and rich broth on a cold day? We huddled into Hide-Chan to get out of the cold and noticed right away the quirkiness of masks on the walls of popular animated characters. It seemed a smaller restaurant with just a few tables lined up narrowly. The service was prompt and after going through the menu that focused mostly on ramen, we opted to append our ramen entrees with their Ramen Set available from 11:30AM-4:30PM only for those ordering ramen. 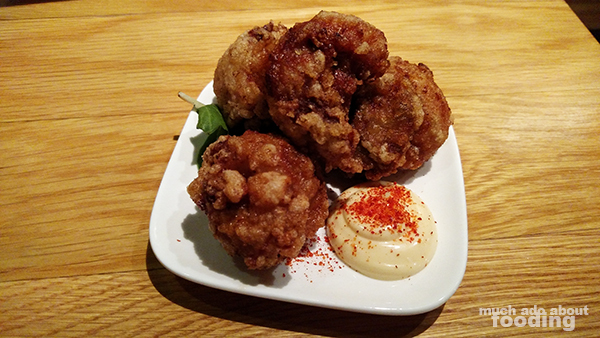 Basically, it allows you to add on appetizers at a reduced price so we went for their Grated Radish Scallion Gyoza (+$4 with ponzu) and Fried Chicken (+$4 for four pieces), also usually known as chicken kaarage. The gyoza came out heaped with a garlicky radish topping that was then added upon with generous amounts of sliced green onions. 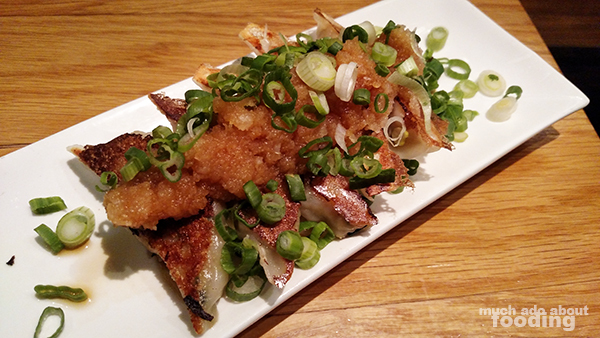 Those made for a sharply savory taste in combination with the neatly crisp dumplings. The chicken pieces were very juicy and large, paired well with a creamy aioli and consisting of a satisfactorily crunchy shell. These were good introductions to what was in store next. One aspect of ramen that some people may overlook is that there is a multitude of broth types and styles depending on region and technique in Japan. Hide-Chan focuses on hakata tonkotsu which results in a cloudy-looking white pork bone broth which is very creamy from the fat and collagen that have leeched out during the cooking process. So far, tonkotsu broth has been my own favorite way of enjoying ramen because of how filling and flavorful it can get so this was the perfect first ramen stop of the trip to make. 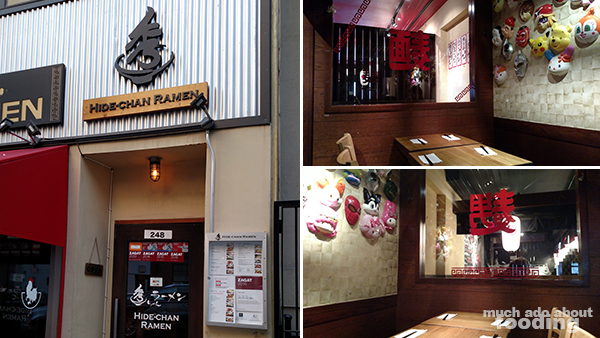 We were curious that their menu listed a classic ramen "since 1963" but ultimately went for different orders. With each entree, you can choose between wavy or straight noodles as well as indicate your noodle firmness (very firm, firm, medium, and soft). My friend went for their Deluxe Ramen ($15 - sliced pork: 3 pieces, boiled egg: 2 pieces, kikurage mushroom, scallion, onion, bean sprouts, and cod roe) with extra spicy red sauce (+$1.50) which I wanted something strong since it was cold out. I chose the Spicy Garlic Ramen ($12 - sliced pork: 2 pieces, scallion, kikurage mushroom, original spicy garlic sauce) with the addition of bamboo shoot (+$2) and garlic paste (+$1). The base broth for both was deliciously creamy and rich. It was obvious that the broth had been in the works for a while now, resulting in a high-quality and well-watched base. Now because I'm a bit sensitive to tastes, I experienced quite the heat from my order that permeate through to my eyes to force a few tears out. Spicy but still nuanced enough to showcase flavors, the spicy garlic ramen was a tasty feat to tackle - I really should've noticed how red the soup was when it came out! On the menu itself, my spicy ramen was denoted with one chili pepper but there was even one with three markings (the Red Dragon); I can't even begin to imagine how insane that hotter one tastes. I liked our time at Hide-Chan and as with many ramen joints, the customization of add-ons and even some base types makes it easier to find what fits your groove.